‘Israeli’ authorities confessed that a long-range rocket launched from the Gaza Strip has struck near Tel Aviv in the center of the occupation entity, wounding seven Zionist settlers. The early morning operation on Mishmeret, an agricultural town north of Tel Aviv, came a day after Zionist warplanes bombed the besieged enclave ahead of the anniversary of Gaza border protests at the weekend. In this respect, the Palestinian Information Center reported that two missiles struck the heart of the ‘Israeli’-occupied territories early on Monday. The attack destroyed a building, leaving at least seven ‘Israeli’ settlers injured. ‘Israelis’ reported an explosion, highlighting the failure of the Zionist entity’s much-hyped Iron Dome missile system to intercept the rocket, with ‘Israeli’ media reporting wide complains among settlers because sirens didn’t go off before the rocket hit its target. 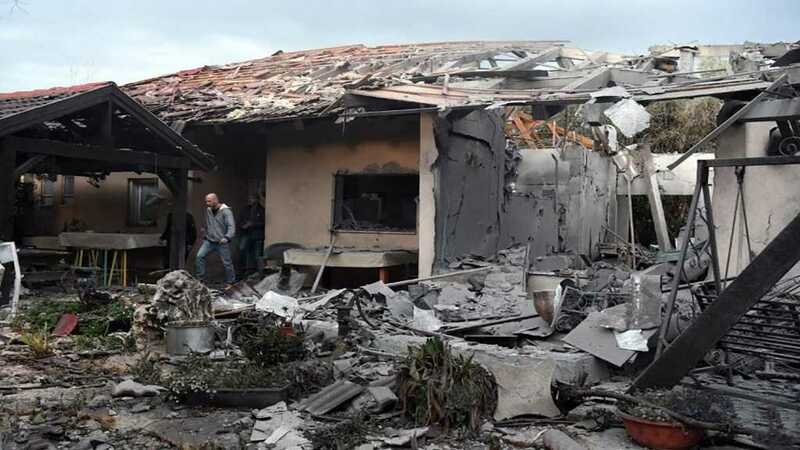 The multi-billion-dollar system was dealt another blow during the latest military flare-up in November, when Hamas fired more than 460 rockets at the occupied lands in less than 24 hours in response to ‘Israeli’ aggression. Tel Aviv and outlying towns had last come under such an attack during the 2014 war on Gaza. A week and a half ago, two rockets were fired at Tel Aviv from the Gaza Strip but the ‘Israeli’ military said they had been launched accidentally. In wake of the operation, Zionist Prime Minister Benjamin Netanyahu, who is seeking a fifth term in next month’s ballot, was in Washington on Monday for the annual AIPAC conference and due to meet US President Donald Trump. However, after he was informed about the rocket fire, his office announced that he is planning to cut short his trip after his meeting with Trump later on Monday. He called for a consultation with chiefs of the military, Shin Bet and other senior security officials via telephone, according to his office. Earlier on Sunday, ‘Israeli’ tanks shelled Gaza after “incendiary balloons” were launched across the fence throughout the evening, the military said. The day before, ‘Israeli’ warplanes struck southern Gaza Strip. Gaza has been under ‘Israeli’ siege since June 2007, which has caused a decline in living standards. The Zionist entity has launched three major wars against the enclave since 2008, killing thousands of Gazans and shattering the impoverished territory’s already poor infrastructure. A self inflicted ‘wound’ launched by ‘israeli’ occupation forces into ‘israel’ at the ditections of the Crime Minister. He is seeking re-election. Typo on ‘directions’ in my above comment.